While Imperial Germany built dreadnoughts in classes of four and sometimes five ships, cruisers lagged well behind in the funding race despite a much greater need for the smaller vessels. Usually the Navy only ordered a pair of new “small cruisers” (light cruisers in other navies’ parlance) in a fiscal year, and these had to be spread between the fleet’s scouting forces and overseas stations. By the summer of 1916, the Imperial Navy had lost 17 small cruisers: Hela and Undine to British submarines, Ariadne, Mainz and Cöln in 1914 to British battle cruisers, Frauenlob, Rostock, Wiesbaden and Elbing at Jutland, Bremen to mines, Leipzig and Nürnberg at the Battle of the Falklands, Emden in a gun battle off Cocos Island, Magdeburg to grounding, Karlsruhe to an accidental internal explosion, and finally Königsberg and Dresden scuttled by their crews far from home. Additionally, Breslau had gone to Constantinople in 1914 to be “sold” to the Turks and wasn’t coming back any time soon. 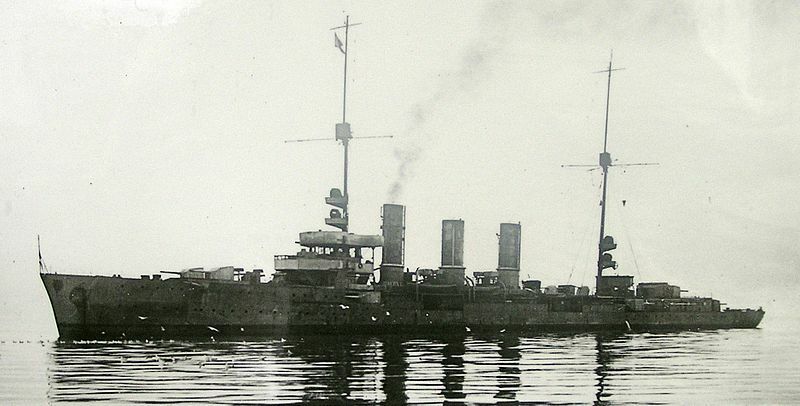 The outbreak of war lifted budgetary restrictions, and the Imperial Navy’s 1914 program included a dozen new cruisers: two fast minelayers built using turbines ordered by the Russians and seized by the Germans, and ten of the Cöln class (often referred to as the Second Cöln class). For the sake of building speed, the new class’ design would be a modified version of the previous one, the Nürnberg class (similarly called the Second Nürnberg class). Light cruiser Cöln, lead ship of her class. The Imperial Navy had hit on a satisfactory light cruiser design with Wiesbaden, built under the 1912 program and laid down in 1913 with one sister ship. The 1913 program included four improved, slightly larger copies (the Second Nürnberg class). These cruisers displaced 5,400 tons, on a hull 145 meters long with a 60mm armored belt and 40mm armored deck. Main armament consisted of eight 150mm (5.9-inch) guns, all in single mounts distributed with two forward side-by-side, two on either side in “waist” positions, and two more aft in superfiring alignment along the center line. The ships carried four 450mm torpedo tubes (in a pair of single mounts on either side) and a pair of 88mm anti-aircraft guns. The geared turbines in Karlsruhe produced over 50,000 horsepower, good for a speed of 29 knots. All of that yielded a ship larger, more heavily armed and slightly faster than the British C-class light cruisers then entering the Grand Fleet. The British ships did have a superior gunnery layout, with all five of the 6-inch guns carried by the later groups of C-class cruisers positions along the centerline and able to fire on either broadside – the same number of guns as the bigger German ships. While the British ships were intended primarily for fleet service – Britain had plenty of older armored cruisers for colonial duty – the German cruisers had to serve multiple roles, and even with war upon them the Imperial Navy designed cruisers capable of service on foreign stations as well as ahead of the battle fleet. That required a bigger ship with greater range. The High Seas Fleet considered these ships a very sound design, and very successful. The Second Cöln class kept the geared turbines of Karslruhe, which vastly improved their fuel efficiency and therefore their range. The dozen boilers of the previous class, 10 of them coal-fired and two oil-fired, went to fourteen in the new ships with eight of them burning coal and six burning oil. They had the same gunnery layout as the preceding class, but swapped the 450mm torpedo tubes for more-powerful 600mm models and added a third 88mm anti-aircraft gun. All ten cruisers were to be fitted to carry and lay up to 200 mines. Like previous classes, the new cruisers had two propeller shafts and were considered highly maneuverable. Five of the new cruisers were laid down in 1915, and five more in 1916. And then work proceeded very slowly; Germany had possessed a vibrant heavy industry sector before the outbreak of war, but performed terribly in organizing that economy for war. Factories and shipyards suffered labor shortages while at the same time farm laborers and workers in small businesses were thrown out of work when their managers or owners were called into uniform. Unemployment rose even as war industries desperately needed more workers. 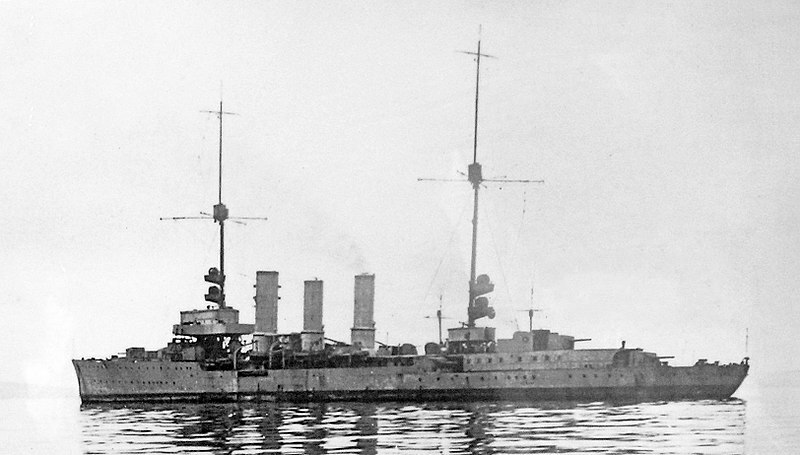 Light cruiser Dresden, of the Second Cöln class. Britain laid down thirteen light cruisers in 1915 and 1916, and commissioned all of them before the end of the war. Germany laid down ten of this class, and commissioned two: Cöln in January 1918 and Dresden in March. Of the others, one (Wiesbaden) was five months from completion when the war ended, two of them (Leipzig and Rostock) seven months away, one (Magdeburg) nine months away and one (Frauenlob) thirteen months away. The remaining three were never launched. The A.G. Vulkan shipyard in Stettin did complete the two cruisers of the Brummer class also laid down in 19195 relatively quickly, as they did not need their turbines manufactured, and both saw considerable action before war’s end. Neither of the new cruisers of the Second Cöln class assigned to A.G. Vulkan would be commissioned. Cöln and Dresden both took part in the High Seas Fleet’s last sortie, in April 1918, and both were slated to play a major role in the abortive October 1918 attack on the Thames estuary. Their crews remained loyal to the fleet command during the Sailors’ Revolt, with Dresden’s crew scuttling the ship rather than turn her over to the rebels. She was raised and given slap-dash repairs, and both cruisers went to Scapa Flow to be interned after the Armistice and were scuttled there, where their wrecks remain. Their eight sister ships would all be scrapped over the next several years. We included all seven of the ships actually launched in our Jutland game, and the three scrapped on the slip are in Jutland 1919. The ships in Jutland bear the names they were assigned. German practice did not grant an actual name to a ship until it had been launched, and so those in Jutland 1919 have been given the names of German cities in keeping with the usual practice; one (Bremen) carries the name of a sunken light cruiser and surely that would have been used for one of them. 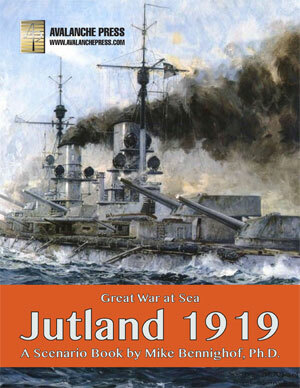 You can order Jutland 1919 right here.